Tobias Harris said the Magic were feeding off Nikola Vucevic (above), who finished with 24 points and 23 rebounds, in Orlando's 110-105 victory over Charlotte. 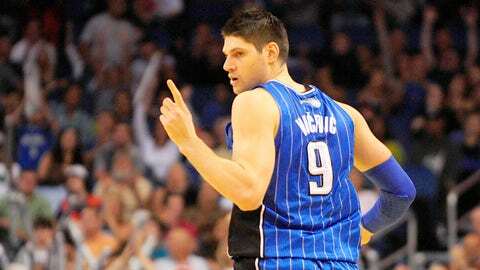 ORLANDO, Fla. — Nikola Vucevic had put up monster numbers in overtime games before. His 20-point, 29-rebound effort in December 2012 against the Miami Heat broke an Orlando Magic single-game record for rebounds that Shaquille O’Neal had held since 1993. But the Magic lost that game and trailed from the start Friday night against the playoff-bound — yes, playoff-bound — Charlotte Bobcats in what was taking on the look of another outing where the lottery-bound Magic would fight hard but fall. Vucevic would have none of that. Bouncing back from a rough first quarter when it came to shooting the ball, the 7-footer ended up with 24 points to go with his 23 rebounds. Best of all from the Magic’s perspective, they won for the second time this week, coming away with a 110-105 victory. "I started off the game kind of slow offensively," he said in a happy locker room afterward. "But I felt pretty good because I was able to rebound and I was pretty active defensively. And I knew at some point I would turn it around and start making some shots. I got some easy ones and started feeling better." 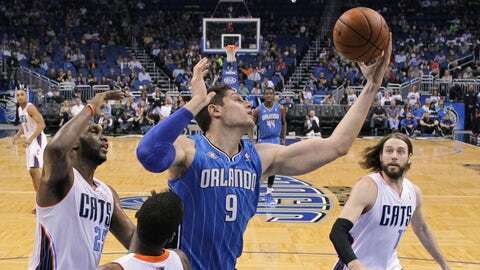 Vucevic missed a number of shots near the rim as the Magic fell behind by double figures in the opening five minutes. But those began to go in for him toward the end of the second quarter. Nikola Vucevic sixth game of at least 20 points and 20 rebounds help the Magic overcome huge first-half deficits en route to victory. And while the Magic couldn’t have been too happy with trailing 50-41 at halftime, their ability to hold Bobcats center Al Jefferson in relative check proved to be a sign of things to come. Jefferson, who picked apart the Magic in January when Vucevic was out because of a concussion, had only 10 points and three rebounds in the first half and 10 points and five rebounds from that point forward. "I was very locked in," Vucevic said. "Al was one of the guys that I had a lot of trouble with last year. When we played them at Utah, he had (31) on me. That’s a game I watched a lot over and over to see what I did wrong and learn from it. I’m not going to limit him to zero points obviously. He’s going to score. But I tried to do my best, tried to keep him away from the paint as much as I can." "The bigs overall worked their tails off to push Al out, to not let him catch it on his sweet spot," coach Jacque Vaughn said. "We talked about that in the pregame, how that was going to be the deciding factor if we could get him off his spot and make him react to us." Vaughn’s lineup of Victor Oladipo, Kyle O’Quinn, Tobias Harris, E’Twaun Moore and Doron Lamb held the Bobcats — albeit with Jefferson on the bench for most of the time — to six points in the first five minutes of the fourth quarter. When Vucevic returned at the 6:27 mark, he helped put them ahead at last with two quick baskets. "We kept it together," he said. "We kept fighting. And once we got back in the game, we started playing very aggressively at both ends of the floor." "We were kind of going off what he was doing out there and feeding off him," said Harris, who turned in another strong game off the bench with 15 points and seven rebounds. The 16 rebounds Vucevic had in the first half fell just short of the team record for a half set by O’Neal. His final total of 23 was three off the NBA season high set by Dwight Howard and matched by Andre Drummond. "There was really no specific reason for it," he said. "I was trying to go aggressive to the boards, trying to grab them, and the ball was coming my way." "He goes out there and he goes after the ball," Harris said. "That’s what he does best, and tonight you saw that first-hand." And after having dropped five of their previous six overtime games, sometimes in excruciating fashion, the Magic thrived when the pressure was on. Arron Afflalo forced the extra five-minute period by hitting a 3-pointer off a screen set by Vucevic, and Jameer Nelson put them ahead to stay with his third 3 of the night in his first game in 10 days. Nelson had the Magic’s only two field goals during overtime, but that was because they went to the free-throw line so often. The Magic were 8 of 10 from the line in overtime and 26 of 35 for the game. "Guys have learned," Vaughn said. "That’s what growth is, being able to learn from some of your mistakes." And no one in the Magic locker room could quibble with the end result.